I get antsy every year about this time. I want to repaint all the walls and win the lottery so I can buy bolts of dreamy fabric and stacks of throw pillows. Since I don’t buy lottery tickets, I’m probably not gonna win the lottery and so I’ve learned to freshen up my spaces on the fly with zero money and just a little bit of time and effort. If you follow me on Instagram, (and you SHOULD!) then you know I’ve been redecorranging. What is re-decorranging you ask? When I move them around, I see them and enjoy them again. And that motivates me to clean. So there’s the real magic. All this moving stuff around exposes some dust bunnies and cobwebs and now it seems fun to clean because I’m about to have brand new looking room, gentle friends! So here’s what I did. I started with my normal sultry master and removed everything with color. I took the colorful artwork down, the colorful throw blankets, the pillows, rugs, chotch-keys (my spelling), etc. I even removed the duvet cover and put it on a bed downstairs. Then, I walked through the whole house and found everything neutral that made me smile. I also grabbed the small disco ball from Emme’s room. Here’s what I ended up with—a very relaxed and textured bedroom with lots of layers. It all looks so very comfy and puffy and Nester-eqsue and we all know how much I adore her. I probably would have moved the rust chairs too but the pesky stress fracture kept me in line. I liked once I lavished them with neutrals. If the master was sultry before, she’s taken a slight turn toward the angelic. Then, of course I hauled all the colorful and dark/brooding items to the living room and ta-da—a freshened up space for zero dollars and I tricked myself (and a good friend!) into cleaning. I took two of the pieces of artwork to my bedroom. I spray painted the horse head bronze and moved the gray bust to my office. I also brought my canvas up from downstairs and added a few more brooding strokes. 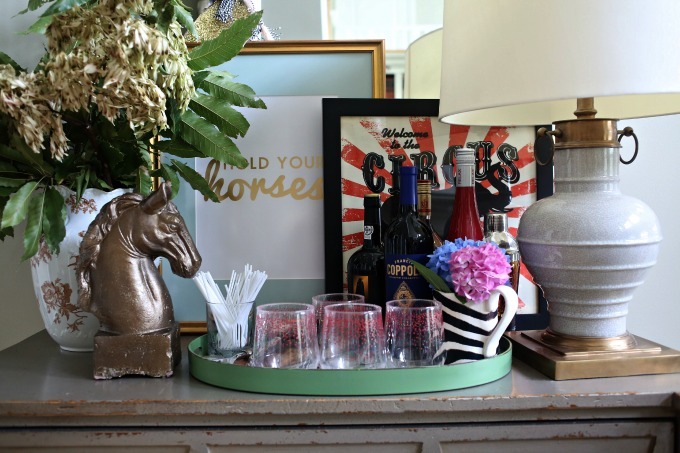 I moved the Hold Your Horses sign from the mantle to the make-shift bar cart. 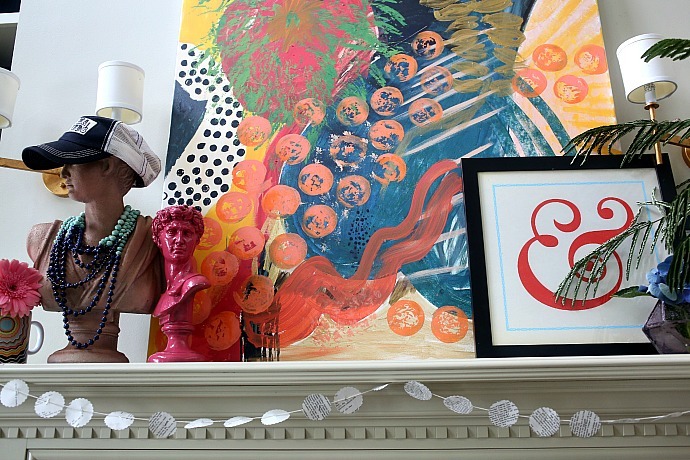 And that my friends will always be my favorite decorating trick. Now, some of you are gonna say that you don’t have the right kind of stuff that can be moved around easily. I would say you never know until you try. I’d love to see what you come up with this weekend if you get in the mood to shuffle things around. Just tag me on Instagram! Love Love Love your New Angelic Master, and I think she is still Sultry! After all she now has fur, and a disco ball, and animal print rug, P-R-E-T-T-Y Wild!!! I read the Nester’s book, and went to Home Goods for a large rug(her tip from book) and our living room looks Amazing! I’m so re-decorranging this weekend, AND watching football,,thanks for the inspiration! OH, I bet it’ll turn out awesome, June!! And we’ll be watching lots of football too! Edie, I redecorranged in the Spring – after I read your blog. Boy! Was it fun! I am unable to rearrange furniture much because of huge cast iron radiators (cool things in their own right), so this was the punch my winter blahs needed! I think you should copyright the word “redecorranged”. Yes, the sultry master has definitely taken on a nester-esque quality. Love it. 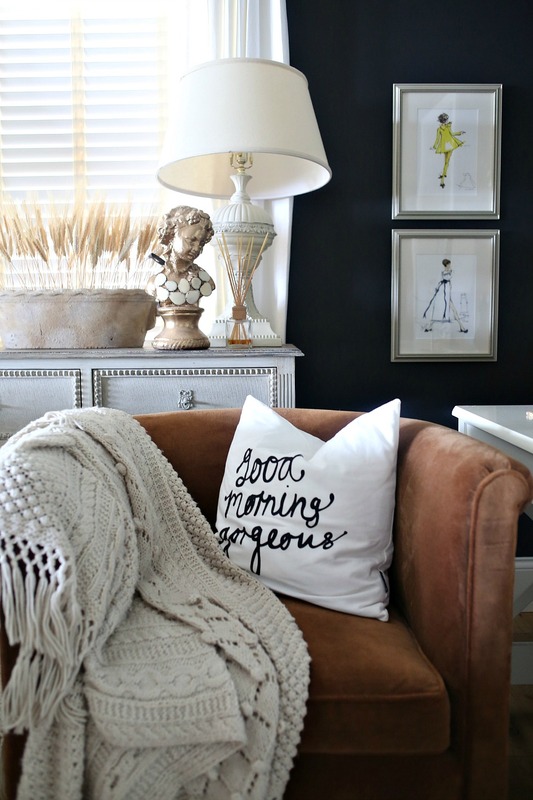 I am definitely in the mood for cozy autumn nesting and a change of scenery in our home without spending money. Last week I found myself moving things around and decorating in the cheapest way possible, such as a few new yellow candles that make a huge difference! 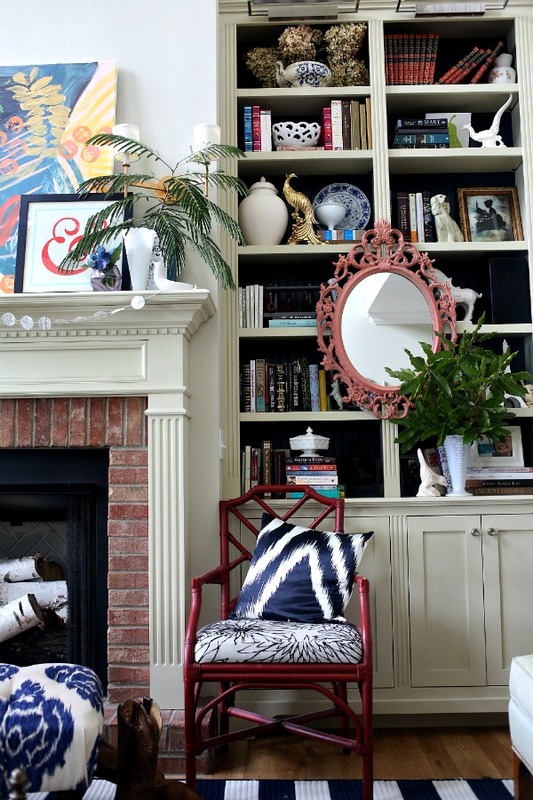 Love your rooms and style! I think your new bedroom is just stunning! Wow! What a great lesson in redecorranged! Where did you get your headboard?? 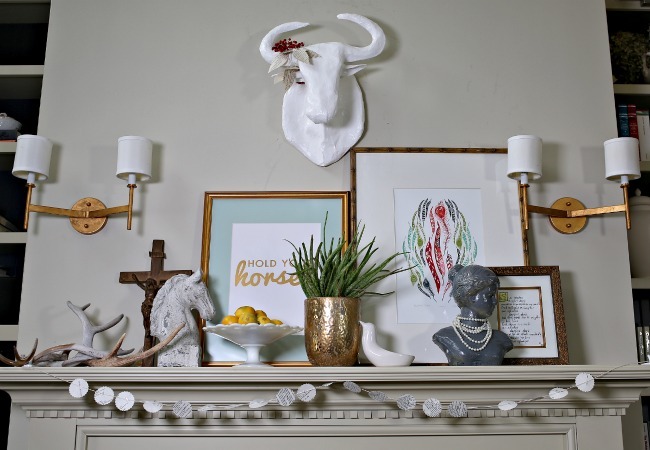 I cannot get enough of your redecorannging (wait, do I say that right?) I cannot believe how much I liked your master before and even more after. 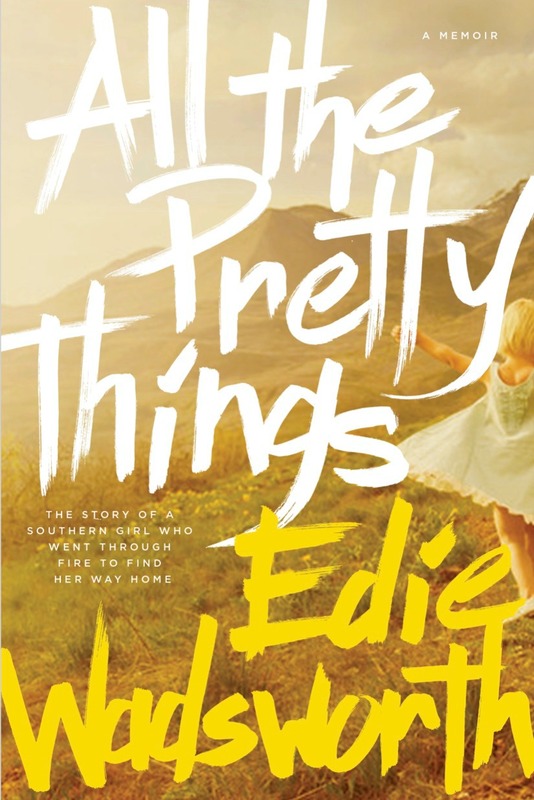 You have a gift, dear Edie. Thanks for sharing it. This is too funny…as I’ve gotten older and wiser (only 47 though lol) I have started to do this instead of heading out to Home Goods for every change of the seasons! 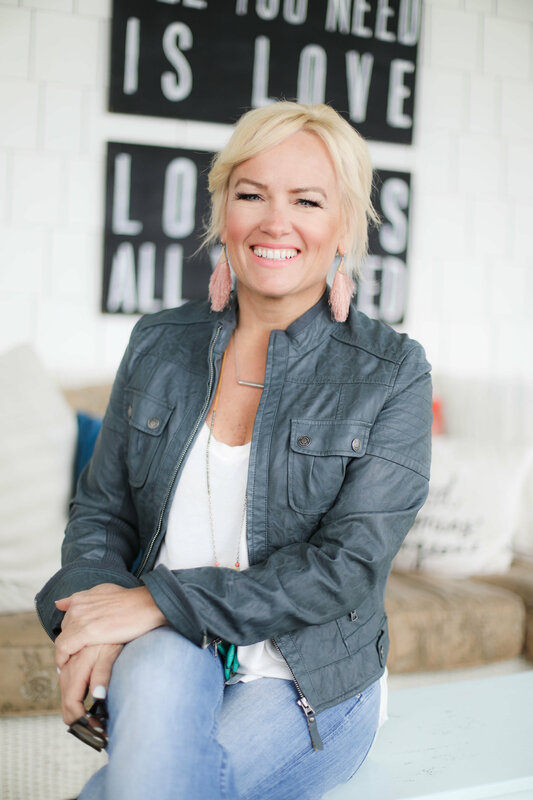 I think the ability to do this comes from filling your home up with things you really love and actually being grateful and satisfied with what you have…I was actually doing this today when I took a break…Love the before’s and after’s especially your bedroom! YES!! I think that’s the key too, Jill!! Brilliant! I’ve just come home from10 days away and I’m chomping at the bit to do the same. Thank you thank you THANK YOU for the extra incentive!!! It looks fabulous!! I’d love to see your afters, Camille!! You give me hope!!! This story came in a very timely manner for me. I am currently trying to do this in my home. Unfortunately I don’t have that delicious headboard that you do, wow! I love thrifting for new decor, people get rid of amazing pieces, I assume because it becomes stale to them as well. I know! Thrift stores are my favorite! I am so glad to hear that someone else does the moving around of things they already have. I have done this for so many years and do it a little or a lot almost every week. It is a great way to see things in a new way and make the house feel so fresh. Of course I tell everyone you and I are twins, even though we look nothing alike. We just love the same things. Love what you did. Best kind of twins, in my book! I used to not want others to copy my design until my niece also became a designer and said she loved what I did and copied me on things. Talk about making me feel special! Then I copied some of her ideas. I now love to copy ideas from some of my favorite people who have my type of taste. I just put my home state of Texas flair in there or something. I also use a vintage piece in every room. Now I have copied you. Wish we could have coffee. I would show you all these pictures on my phone. Haha. Thanks for all your inspiration. I do it all the time! So much more fun & satisfying than spending money & accumulating more stuff! Love the changes you made. ooooohhhh!! I loooove it! And man I wish I had thought of that word! Redecorrange… so.awesome!! I’m feeling the pull to do it right now… I just finished recovering from a sprained foot- where I had plenty of time to plot my next furniture move from my seat on the couch!! I ♥ your post and am off to read more of your blog and find you on the instagram! Have a wonderful day and thanks for the inspiration! Now, I have plenty of storage space in the shop for seasonal things and I just ‘shop’ my own stuff. Hubby hates moving furniture but we get into the rearranging together. I have saved so much time, money, and peace of mind. I wish more people realized that more is not always more. I love the new look of your bedroom! Also, what is the paint color on your bedroom walls? It looks stunning! It’s called Graphite by Benjamin Moore. Love it! “Redecorrange” is my new favourite word! Thank you for that! I love this word! For years I’ve been throwing out and buying new… only to realize in another six months that “I wish I still had that one piece…” So I have also started “redecorranging!” The catch for me though, is that I live in a four bedroom house with three roommates! My place to play in my decor dreams is my bedroom, and that’s pretty much it. Most things elsewhere in the house aren’t even mine to use! My solution? I have two plastic tubs in our basement that holds all the crap I love but need a break from. I have things from about four different color schemes, and I keep combining them or spray painting them in new ways to come up with even more designs! I’ve even started doing this with the clothes in my closet! When I find myself just bored with an item, but it’s still in good shape, I throw it in a bin downstairs. When the next season rolls around and all I want to do is shop for a new wardrobe, I just head to the basement and switch out a few things; WA-LA! Anyway, thanks for adding the word to my vocabulary, and letting me know I’m not the only one! Hello! I love your new room! Could you please tell me the pain color and brand you used? It’s exactly what I’m looking for! your stuff prior to and you’re just extremely fantastic. it. You’re making it entertaining and you still take care of to stay it sensible. Where did you get the faux zebra rug?? Could you please tell me where you got that beautiful headboard and bench in front of the bed? 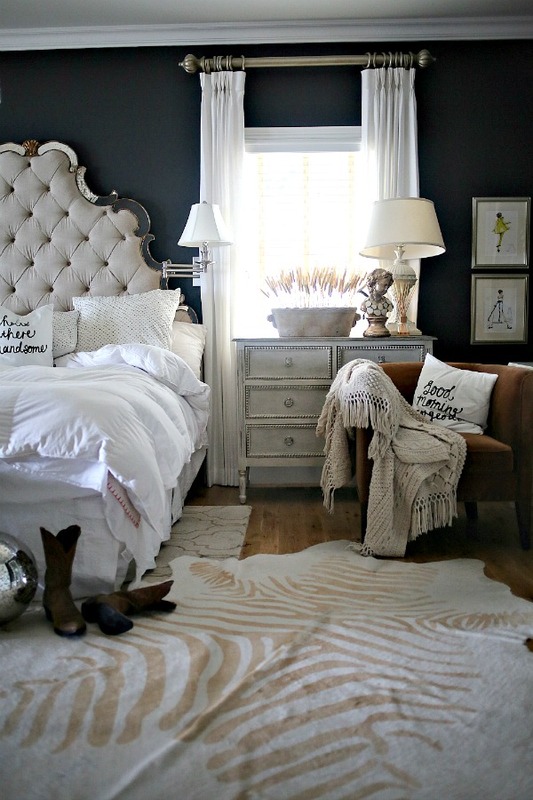 I have been looking for a vintage headboard like that. Yes I would love to know this as well!! 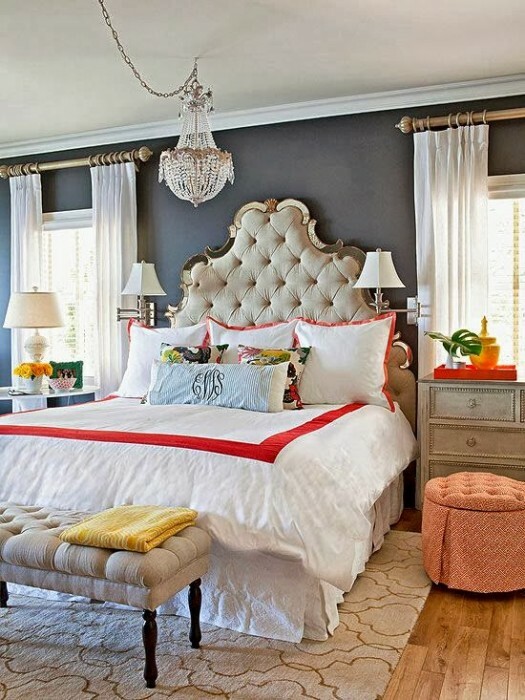 I would love to know where to find this headboard as well! I’ve been searching forever! Hello! Could you tell me where you got your side dresser in your room next to the bed? It’s absolutely gorgeous & is something I’m looking for, for my bedroom! Thank you! We’re you able to get an answer regarding the side dresser? I’m interested as well…beautiful piece! I love the Sultry Master bedroom! It’s gorgeous! May I ask where you got the bedding and side dresser? Hi there! Love the new room! Where is the headboard from? 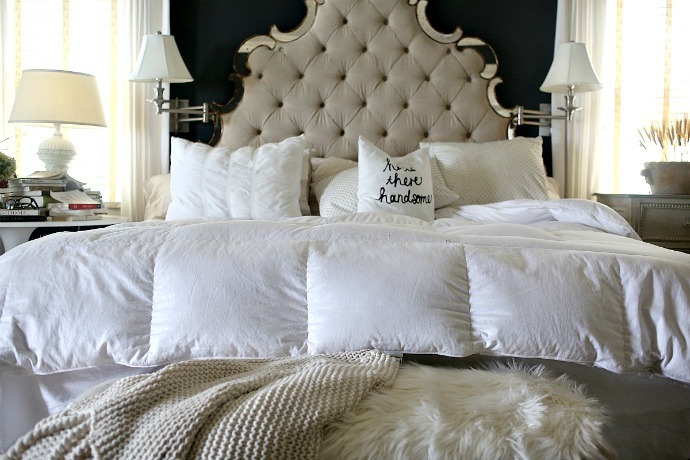 I haave been in search for this headboard for years!!! I saw it years ago and should have bought it. Would you mind sharing where you purchased it. Getting ready to build our dream house and this is my dream headboard for my master suite!!! 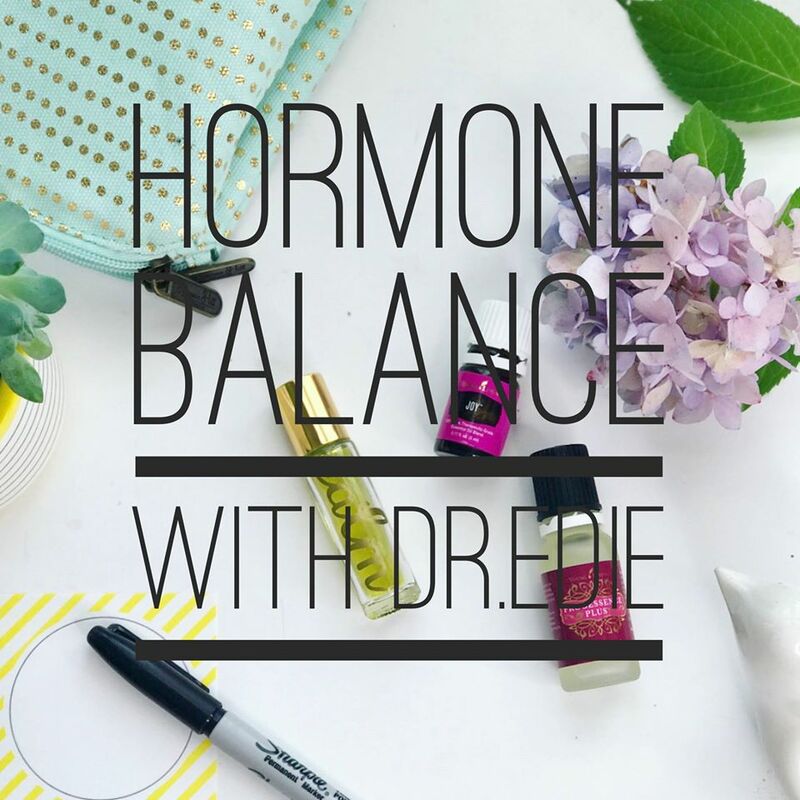 Love, love, love that I have come across your blog! This is me if ever I could explain in words! Love to rearrange and love that I am not alone! Looking forward to reading more – after I paint the walls in the den of course. Happy decorranging! What is the actual color of the trellis rug in your bedroom? Where did you get your bed frame? I love it. Where did you buy the night stands from?